I’d managed to get myself a couple of vintage Madeleine tins a few months ago and, despite my best intentions, they’ve just sat gathering dust in my kitchen. That is until today when I decided to ‘get my bake on’. I based my recipe on this one from my beloved Little Paris Kitchen book by Rachel Khoo. In her recipe, Rachel uses raspberries and lemon curd, but I’m not one for sickly cakes so I decided to keep things simple with the addition of some roasted flaked almonds, scattered on the top just prior to baking. You need to allow a bit of time to prepare the mixture, because the batter has to chill for a few hours before baking. Once the mixture is chilled, the madeleines bake really quickly. Perfect for lazy Sunday mornings, served warm from the oven with a fresh cup of coffee. Oh I am actually drooling! 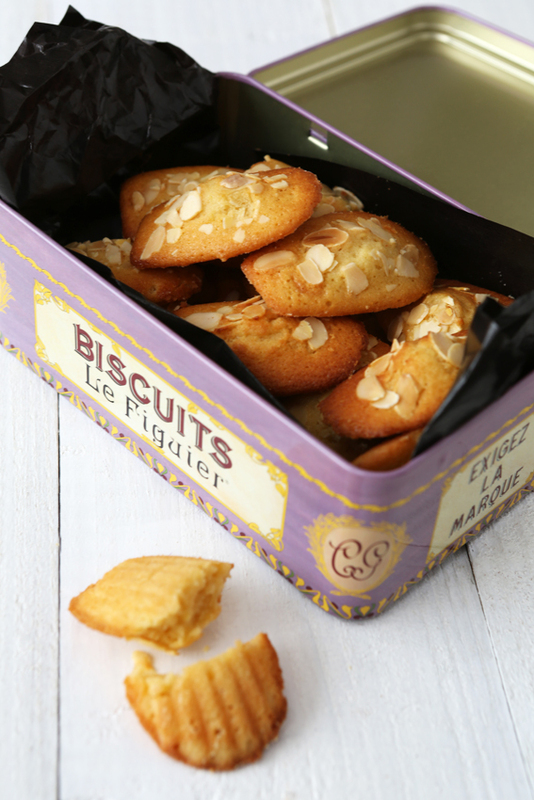 I’ll have to drag my madeleine tin out from its dusty home at the back of the cupboard. And I LOVE that tin! They look like they turned out really well Heather – I have the Little Paris Kitchen book too but so far have only made the savouries. Hi Sophie, apols for the delayed reply! The tins were from a charity shop in Lewes. I was beyond excited when I spotted them. That’s the trouble with charity shops though, you never know what you’ll find. I will keep an eye out for you – if I see any more I will give you a heads up! I love me a madeleines; have to agree I don’t like them too sicky. These look a delight so I’ll just have to keep an eye out for some vintage tins too now. Thanks Andrew – Yes, those tins are quite hard to find. The modern ones I’ve seen for sale seem to be often too large for ovens, and I’m not a fan of those silicon ones. I know its a heresay but I made madelaines in jam tart tins and they were delicious if not quite so authentic. Love the idea of vintage tins.